My dog got her first 100 followers in 3 days (again, it took me months to get my first 100 instagram followers!) 😉 The first follower are the most difficult to get – so don’t dispair if it takes longer! Before you start liking and commenting, post at least 6 or 7 pictures that show a glimpse of what you’re going to share in the next months. So if you plan to share clothes that you sew, sewing tutorials and your breakfast, show a photo of each in your first pictures. If you want to get a large following, it’s best to have a theme. A theme can be your dog, your handmade clothes, your food, your travels etc. If you’ve decided what your theme is, stick to it and don’t post a picture of your breakfast between your puppy pictures! To unify your instagram feed, you can stick to a specific color palette. 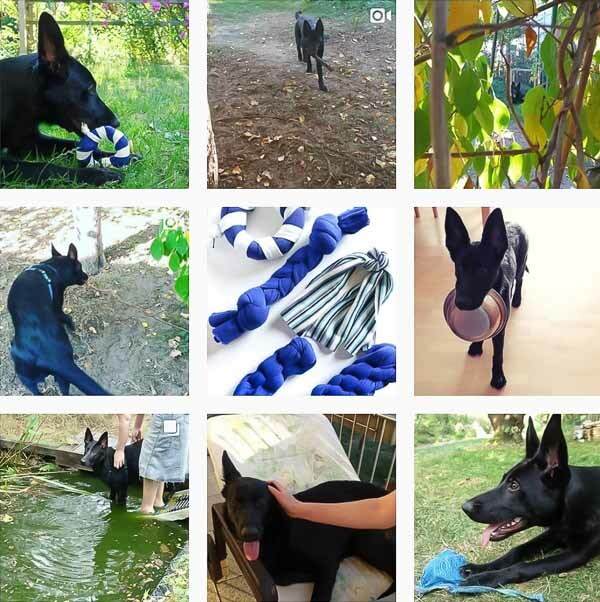 The color scheme of my dog’s account is green, blue, sepia and black-and-white. Your bio is the first thing that your possible new followers see. It’s the place where you can tell your visitors what they can expect from your account. Photos that are well lit, clear, well composed and have an interesting subject tend to get more likes and comments. If your photo is too dark but otherwise good, you can use a photo editing software to improve it. I use lightroom to edit my photos. You can add up to 30 hashtags per photo. Use hashtags that describe your picture. 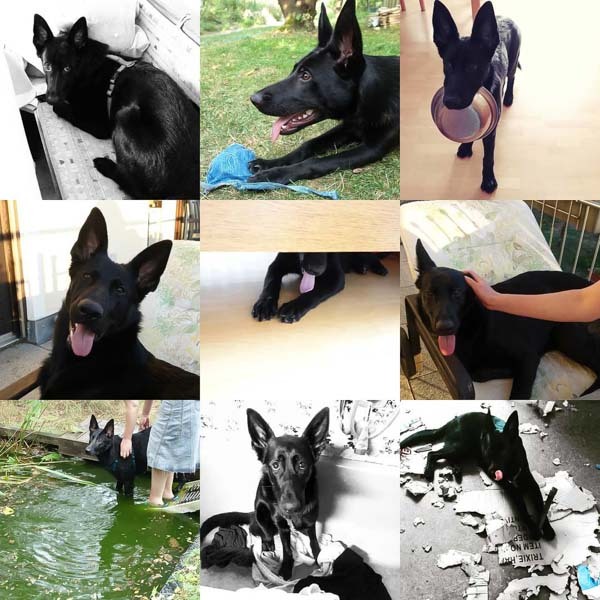 For a photo of my watercrazy black German shepherd puppy I could use hashtags like #WaterDog, #BlackGSD and #BlackPuppyLove. But you shouldn’t use the same 30 hashtags for all your photos because instagram would classify your posts as spam. Variation is key! Don’t tag your photos with (two many) broad one-word hashtags with millions of posts under them, such as #Food or #Summer. Potential new followers might not even see your photo in the hashtag feed because the hashtag is so popular that hundreds or thousands of people are posting under the same hashtag at the same time. Use specific two- or three-word hashtags instead, such as #FoodFromScratch or #SummerHairDontCare. And follow-unfollow bots frequent one-word hashtags (more about the follow-unfollow game below). Instagram is a social media so you have to be social! Like, comment and follow other accounts in your niche. The more active you are the more likes, comments and followers you get! Research who your audience is. Post when they’re active on instagram and post what they want to see. I love to cook historical recipes and blog about them. In the past, I shared photos of my homemade historical food on my historical costuming instagram account @lina_sewhistorically but the photos were less popular than my other photos. 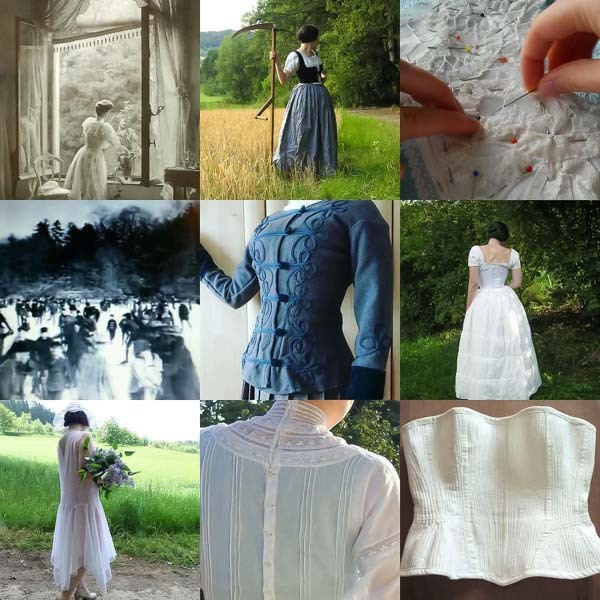 My followers want to see my finished historical costumes, read historical fashion tidbits and watch sewing and lace making videos. Liking photos with similar hashtags as yours is what works best to grow your instagram account fast. And it attracts the right followers: because followers with the same interests are more likely to like and comment on your photos. 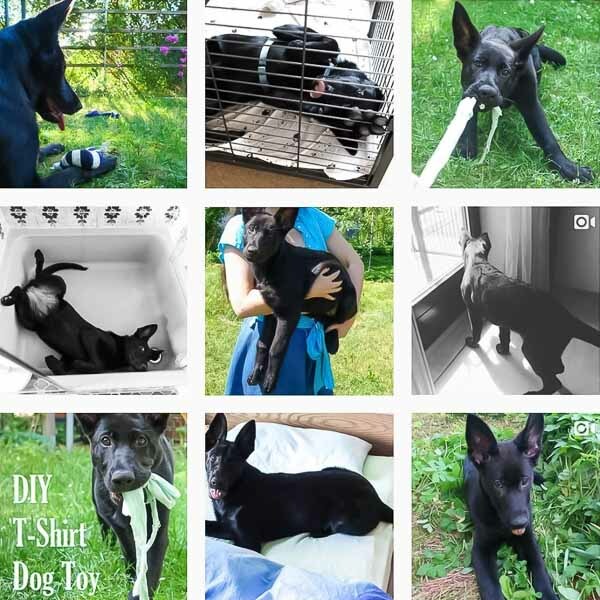 For my dog’s account I browse daily through hashtag feeds, like #GSDPuppy, #BlackGSDPuppy, #GermanShepherdsOfInstagram and #PuppyLifeIsHard, and I like and comment on photos that appeal to me. To get the attention of your possible new followers, many instagramers use the 5 Likes + 1 Comment + Follow – Rule. They like at least 5 photos, comment on at least one of the photos before they follow that account. 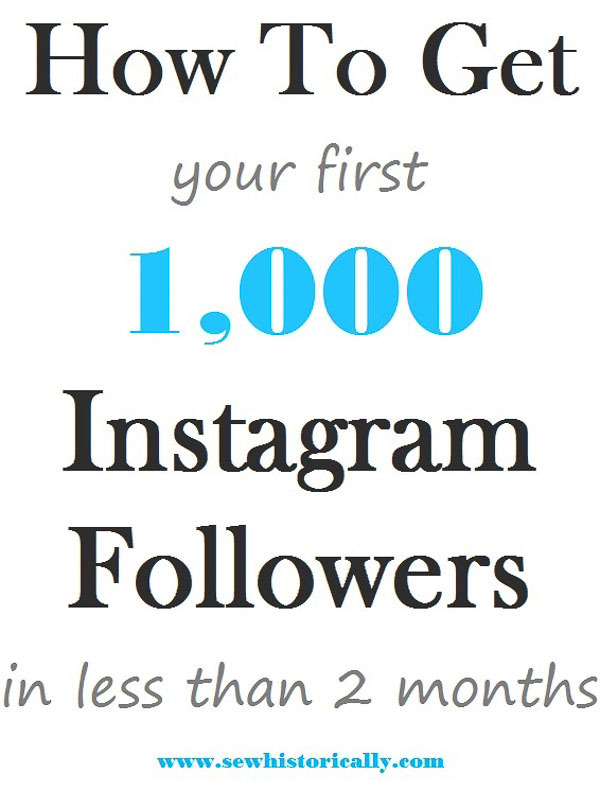 This strategy really works and I myself are more likely to follow back if someone likes my picture and not just follows me (fake accounts often follow – and unfollow you after one or two days – without liking your photos first). I usually follow back accounts with similar interests: pet accounts on my dog’s account, and sewing and historical costuming accounts on my blog’s account. But I never follow back big account with a high followers-low following-ratio and fake accounts with a bio such as “Follow us if you like daily German shepherd photos” because those accounts unfollow you as soon as you follow them. Following back doesn’t grow your account immediately but it’s great for your engagement rate. The engagement rate is a combination of how popular your last photos were (likes + comments), how active you are on instagram (liking and commenting on other’s photos) and your follower number. The average instagram engagement rate is between 2 and 10%, while big account have a lower engagement rate and small accounts have a higher engagement rate. So the engagement rate of my dog’s account in November 2018 was 14,5%. Don’t buy followers or play the follow-unfollow game to gain new followers! This actually hurts your account, your credibility and slows your growth. You can usually tell if an account has bought followers or plays the follow-unfollow game by looking at their number of followers and likes per picture – you know those accounts with ten thousands of followers and just a mere 100 likes per post. Bought followers and ghost followers provide low engagement on your posts and the instagram algorithm punishes you for that: your photo gets shown to less people in their feed and isn’t placed at the top of the hashtag feed. Furthermore your account looks spammy to new potential followers. I never follow back those spammy looking accounts or like their photos because I know they unfollow me after some days. Participating in challenges is a great way to find like minded people and attract new followers. 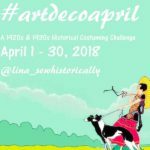 I participate regularly in challenges with my historical costuming account but not with my dog’s account. On my dog’s account I often use weekly hashtags instead. Every day of the week has its own trending hashtag. Popular weekly hashtags are #MotivationMonday, #MondayMood, #TransformationTuesday, #TipTuesday, #FlashbackFriday, #Caturday and #SundayFunday. On my watercrazy dog’s account I often use #TongueOutTuesday, #WetDogWednesday and #ThrowbackThursday. Try to respond to every comment, even if it’s just “thank you” or an emoji. It shows your followers and possible new followers that you care about what they’re saying. And instagram is more likely to show your picture in your follower’s feed if it has a lot of comments. Keep in mind that instagram only counts a comment as comment if it has three words or more. Instagram stories are important for big accounts. If you have a large following, your followers might not even see your posts because of the new instagram algorithm. Posting stories reminds them of your account and your followers are more likely to visit your account again and like your photos and comment on them. Don’t just promote your blog or etsy store or a product. Use your instagram account to show behind-the-scene pictures of your blog or business or share some exclusive information with your instagram followers that you don’t share on your blog or other social media accounts. When you have a new instagram account, your following number is usually higher than your followers number – that’s ok. But eventually your following number should be lower or equal to your followers number. Such a great post Lina. I am so sick of those follow unfollow sites. Do you think it hurts you if you follow someone and then if they don’t follow you back you unfollow them after a week? Thanks so much, Mary! 😀 It doesn’t hurt your growth to unfollow them. I hate those follow-unfollow bots too. I never heard 5 likes than comment technique but it makes sense. I need know I am more likely to follow if they like my posts and comment. Thanks, Lanae! I’m glad you found it helpful! Ps. I am going to try out all your tips! Thanks so much, Kippi! 😀 Have a great week too! Great tips! Finding your audience is a big one. Great advice thank you 😊 I will try some of the tips out and hope they work with my second account. Thanks, Claire! 🙂 I’m glad you find it helpful! Well, I can see that I have a lot to learn! Hi this is Kristina visiting from Making a Home. Thanks for the great tips. I know I should get started on Instagram one of these days. I will be referring back to this soon! 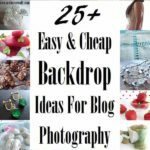 These are some really great tips I’m going to try out! Thanks so much, Tonya! Glad you like it! Thanks for the great tips. I just joined Instagram recently and put up my first few posts this week and I’m still trying to figure the whole thing out so this post was very helpful! Thanks, Angela! I’m happy that you found the post helpful! Not on Instagram yet, but from what I’ve seen in the post I’m inspired. I pinned it. Visiting you on Happiness is Homemade where I posted Healing and Recovery through Self-compassion. Great tips, I think the key to successfully navigating Social Media is the social part. Yes, it is! 🙂 Thanks, Lorin! This was a very informative read. I actually got a little down about my #s but then I took a step back and just reminded myself that I am happy with what I have and for me interacting with people in authentic ways (as authentic as you can get on social media) is super important. I do want to use some of the tips you descried above and am really going to try to do a few challenges, while also working on the 5 likes , 1 comment, follow. Thanks. Thanks, Bojana! I’m glad you found it helpful! This was very helpful. I’ve struggled with Instagram since I started almost 2 years ago. I’ve tried to be engaging and present on there this past week, and have gained almost 100 followers! Thank you for sharing! These are great tips. I going to reevaluate my account. Thanks for sharing on Sunday’s Best. Excellent tips. I was going to choose you as the Inspire Me Monday Linky winner but you already won! Congrats! I learned not to use one-word hashtags and to use the day of the week hashtags more. Thanks! How do I find challenges? Thanks so much for featuring me, Janice! 😀 Instagram challenges are difficult to find. 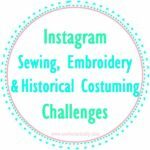 Here I put together a list for Sewing Instagram Challenges and you can search on google or instagram for challenges. Very worthful tips! Some of them are new for me! I am struggling to grow my Instagram account since 2017, but i guess that the fact of posting in Portuguese (my language) and the ausence of a real vintage community interested on it here doesn’t help. Well, my question is: do you think IGTV videos helps the reach?